Cleaning out the freezer has been on my mental list of things to do for months. No, years. It must have been on my husband’s list, too, because one morning he just started pulling everything out and stacking it on the counter. (You never know when he’s going to snap like that.) We said goodbye to unidentifiable leftovers and tiny containers of mysterious sauces. The lack of labeling was a serious problem. We tossed everything that had excessive freezer burn. To be fair, our freezer is not that big, and we didn’t have some kind of stockpile going to waste. Mostly, it housed bits of things we felt bad about throwing away, so we stashed them in the freezer for another day. Too bad another day never came. 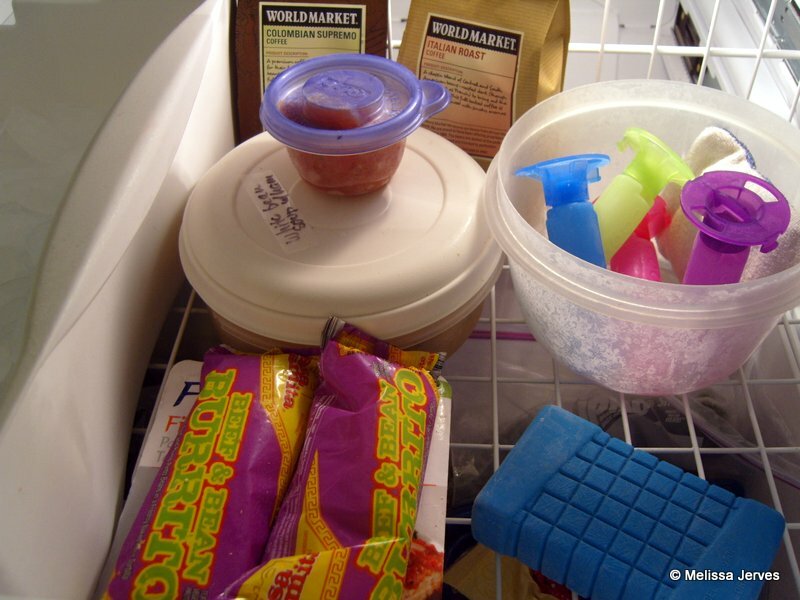 Once the freezer was empty, I vacuumed up the crumbs and scrubbed all the sticky spilled somethings out of the drawer. I don’t have a before picture–just use your imagination. I grouped like items together, consolidating the packaging if possible, and labeled everything. I designated the upper basket as the lunch supply area, and corralled the smaller ice packs in a bowl. The coffee is up there, too, because when you need coffee, you shouldn’t have to dig for it. As I put everything back into the freezer, my husband wrote each item down on a list. 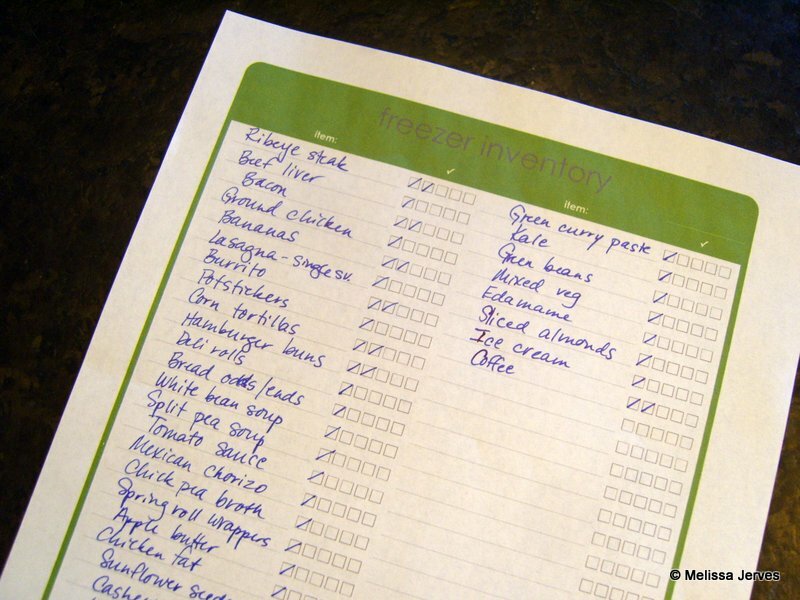 A few days later I googled “freezer inventory sheet” and was rewarded with a huge selection of choices to print. Some were broken into categories, some were not. I decided to go category-free (I’m a rebel like that) because the categories didn’t seem to fit our items, which mostly fall under “Other.” Sure, I could have made my own inventory, but why? Excel is not one of my strong points, and there wasn’t a good reason to reinvent the freezer inventory. I bookmarked the one I printed so that I can print another when this one is used up. I have a few rules for maintaining this freezer nirvana. Always label everything. Always. Everything. 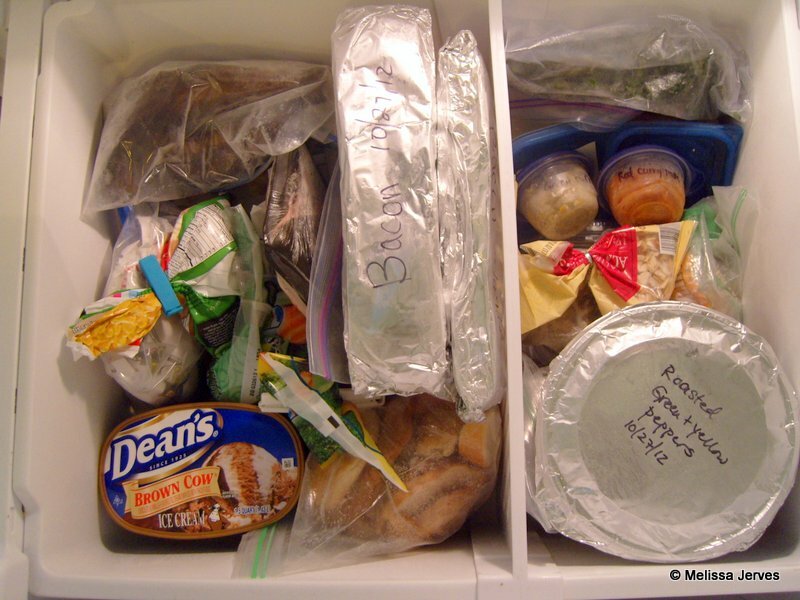 Freeze leftovers in single-serve containers, easy to pull out for lunches. Cook and freeze extra meals more often. Maybe next week we’ll inventory the pantry. But I wouldn’t hold my breath if I were you. The pantry is a lot bigger than the freezer. Doesn’t it feel good when you organize a space? When we moved, I relished the idea of a fresh start, only now my pantries are bulging and disorganized after only a few months. I’m thinking of taking everything out and reorganizing, thanks for the inspiration!! Labeling- and dating- freezer items has made a huge difference for us. Thanks for the inspiration, I’ve got some cleaning to do! Sometimes I just need a reminder–it’s so easy to overlook!